What would it be like to go from foster home to foster home; be seen as a real “problem student” in school (and spending countless visits with the principal? 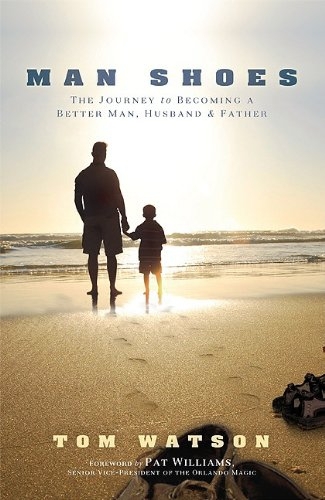 ); at the age of five being placed in the home of an aged pastor and his wife where you find love and acceptance; marry and father two children only to watch your wife die at a very early age; raise two boys by yourself; find someone to love again & father another child; and to lead a productive life? If you are like me and have no clue how to answer those questions, then this book, Man Shoes, is a book you would be interested in. The best way to describe this book is to borrow a word from the subtitle on the front cover: it is a journey. It is Tom Watson’s journey from being an unwanted child put in foster home after foster home, until he is placed in Mr. and Mrs. Watson’s home. The Watson’s were a clergy couple in their 50s who took Tom in and loved him. One of the most touching moments of the book was when Tom was finally able to tell Mrs. Watson he loved her. It would be great to say that all was well after that, but I would be lying. Tom’s life continued to be a journey throughout his youth; through his teen years and into his first marriage and the birth of his two children. I would give away too much of the story if I said much more about the rest of his journey. It is much better listening to him tell it. Eight years ago, while in his 40s, Tom had a stroke. That is what largely prompted him to write this journey…so his sons would know him. I received this book from another blogger with no strings attached. I was unsure about it because I had never heard of Tom Watson. Not only am I glad I read it (and it reads very easily), I highly recommend that you do the same. It is written for men, but it is also for the women who love them. I have been honored by Tom and his publishers to be able to give away five copies of this book. All you need to do is make a comment here and I will trust you if you say that you Tweeted it or put it on Facebook (since I do neither). Each of those gets you an entry. Deadline will be Wednesday, August 31st. I will then choose the winner the old-fashioned way: put the names in a hat and draw them out. 🙂 How’s that for up-to-date technology? Comment away. Sounds like a great book, Bill. I did tweet and posted to Facebook. Would love to receive a copy. Sounds like a great book and I am tweeting it now. You would really like it Jim. Thanks. I am encouraged to see genuine books coming out that deal with the hearts of men. You can walk the aisles of your local christian book store and find a ton of books for women, marriage, or christian living. But books for men are hard to come by. They are there, but few in number. throw my name in the hat Bill. Name is in the hat Craig. thanks. They can sign up for yours first Jay and then come here since mine will go a few days past yours. 😛 blessings to you my friend. Pick me off the ground Camey!! I will include you in the drawing. Maybe you will win since you came by twice. 😛 Thanks my friend. This is fantastic. I love hearing good stories about foster parenting. It’s so sad to be associated with horribly cruel foster parents who lock children in cages. Makes people wonder what our motivation is in fostering, but then you hear wonderful stories like this. Whether I win or not, I’ll have to look this one up. I tweeted and put it on facebook too. 🙂 Thanks Bill. This story has to strike close to home for you Jason. BTW: he lives in Vancouver and visited Alaska. 🙂 It is worth checking out. The Watsons had to be incredible people. I’m learning these days how important it is in our walk with God to guard our heart. Lots of things want to ‘mix in’ so to speak, but as children of God we have to draw a line with the world. If we as God’s children do not stand up and lead in the things of God in the world who will? We need to lay our reservations and the inclinations of our flesh on the altar of sacrifice. And yet is this really a sacrifice or a tremendous move forward in our walk with God? People don’t need to see another failed saint in the world. They’ve seen plenty. They don’t need to see saints who succum to all the fleshly desires that they do in the world. They need to see something greater than that. Intellect and education are not going to accomplish this. The Holy Spirit can. I was briefly reading a book written by John Flavel in the 1600’s. His world and the dilemna of the saints was very similar to our day, it seems. As the Bible says, ‘there is nothing new under the sun’. I am sorry Linda but I think I lost something in the mix here. Are you possibly thinking you are replying to another post? Thanks for coming by. I think my mind was wandering today. Maybe that old-fashioned way will pick your name! 🙂 Thanks for coming by Jason. This book sounds great. I work with foster kids and see the struggles they face. It is hard and sad to hear some of the things they have gone through. You will appreciate the book Dan. You will be included. I must have a virus or bug on my home computer. I cannot type any searches into Google at all. I went to my favorites and I can open these but I cannot type into any of these places. Google or the virus has shut me down in that way. This means that my only option is to read and make comments on the public library computer and use their Internet service. I may only get here 2 or 3 times a week to do this. If I don’t get the virus figured out then I will have to buy a new hard drive and install the software programs again. Yikes! I’m not very computer savy in that way. Maybe this is God saying that I’m spending too much time on the computer? Will miss hearing from you Linda. Thanks for letting me know. I think I’m back online at home Bill. At least I am for the moment. I’m rejoicing! this has to be another ‘God thing’ in my life! I’m not wanting you to put my name in the hat for the book offer. Seems like there are lots of men who want it! Glad you are “fixed.” Thanks for allowing the men to be considered. You have a good heart. Would love an opportunity to read this book! Haven’t read the book … but it brought to mind what God has been teaching me lately – about His rest and entering into that rest in every area of our lives. We long to be better humans in so many ways. The temptation is to work over our flesh life to be better – yet this is the world’s way. The kingdom of God, the gift of God is becoming a new creation with a new heart and mind that is in line with God’s truth and love. It isn’t a work of ourselves, though it too is a journey. This new creation takes form as we abide in the good soil, the Word of God being instructed by the Holy Spirit. When we abide to seek the presence of God, then God performs ALL things for us. It’s tremendous freedom, power and rest… the rest He calls us to. Hebrews 4. So often we underestimate His power, don’t really trust and take on the power of change ourselves. God is calling us to something much bigger – being a part of the divine by His power at work in us. Thanks for coming by my site Rachel. You make a good point about rest. Tom’s life was both good and bad and then really good and then a wreck. When he learned God’s rest it totally changed. I am going to include you in the mix unless you say not to. 🙂 Thanks for visiting my site. I have been to yours through someone else suggesting it and will have to visit more often. Hi Bill. Just a note of thanks for highlighting my book Man Shoes here. We’ve received great reviews to date and the book is listed as a 5 star book on Amazon now. I’m pleased that the book inspired you and hopefully it will inspire millions to consider the roll of faith as they live their lives. All the best to you Bill and good luck to everyone participating in Bill’s – Man Shoes – give away contest. Men will get a lot out of it – and so far the women who have read the book love it. God bless. Thanks for your comment Tom. I see only good things coming from reading the book. Blessings to you as you continue on your journey.